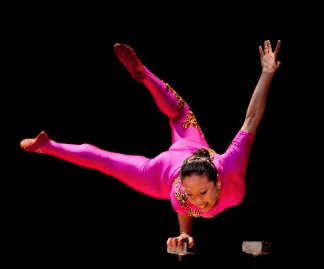 On Saturday, January 26, at 3 p.m., Orange Community Women will present Li Liu in “Traditions of Chinese Acrobatics.” This family event for all ages is a one-woman acrobatic show in which Li performs hand balancing, plate spinning, artistic cycling, ribbon dancing, diabolos and foot juggling. A limited number of volunteers get to join her on stage to create an impromptu ribbon dance, and also to try their hand at plate spinning. The documented history of acrobatics in China goes back more than 2,000 years. Throughout her show, Li explains some of the rituals of Chinese culture and the Chinese New Year, teaches the audience some basic Chinese phrases, and encourages them to think about what it might have been like to grow up in a different time and place. Li Liu was born in the city of Shenyang in The Northeast of China and began her acrobatic training at the age of 6. She was chosen to attend The Chinese National Circus School in the capital city of Beijing where she trained until she was 16. After touring extensively throughout Europe and winning medals and prizes at several festivals, she came to the United States with Ringling Brothers Barnum & Bailey Circus and toured all over the US. She is a regular on the NBA & WNBA half-time circuits and is also a featured performer on Princess Cruise Lines. The show will take place at High Plains Community Center Gym 525 Orange Center Road in Orange. Tickets are $5 in advance and $7 at the door. For advance tickets contact Michelle @ 203=605-4383 or fbailey1@optonline.net or any member of OCW. Orange Community Women is a chapter of Connecticut Junior Women, Inc. We seek to unite the women of Orange and surrounding areas by participating in community service and providing enrichment, leadership and social interaction. Our charitable and community projects include awarding scholarships to Amity students, donating children’s books to the library, collecting for veterans, organizing activities for the Tracy Bunch (a group of special needs adults sponsored by Orange Community Services), visiting and working with the seniors at Silverbrook Estates, donating holiday food baskets and gift cards to Orange Community Services, supporting Relay for Life and partnerships with Days for Girls, Manes and Motions Therapeutic Riding Center and Female Soldiers/Forgotten Heroes. We meet on the 4th Wednesday of the month at 7:00 at HPCC and new members are always welcome. For information about OCW, please contact Donna Wesolowski at donnaweso@optimum.net. On Saturday, Oct. 13, The Orange Recycling Committee hosted its annual paper shredding and mattress recycling event from 9 a.m. to noon at High Plains Community Center which was generously funded by the Rotary Club of Orange. At the same time, the Orange Community Women had a FUNDrive for Clothes and Household Items under the pavilion on the fairgrounds. The clothing, shoes, towels, electronics, toys and games, kitchen items, sporting goods, and other items the OCW collected were brought to Savers on the Boston Post Road. This donation will help support many community projects. This year, they filled about 9 SUVs with your donations. After the morning showers stopped, the women stood by the vehicles and told Orange Live how much they appreciate the generosity of everyone who stopped by and donated so many useful items this year. Orange Recycling Committee Chairman Mitch Goldblatt called this the ultimate recycling event. Once again, Orange resident Joe Johnston, who owns Affordable Solutions, brought his truck for the on-site paper shredding service. He estimated that he’d shredded about 8.5 tons of paper that morning. This is the seventh time the Recycling Committee has offered this service free of charge to Orange residents. All they ask for in return is that residents show their appreciation by donating to the Orange Rotary Scholarship Fund. Rotarians were on hand to collect donations and helped unload cars and broke down boxes all morning long. The Orange Recycling Committee’s paper shredding and mattress recycling event scheduled for Saturday, October 13, from 9 a.m. to noon at High Plains Community Center (HPCC), 525 OrangeCenter Road, will once again be joined by the Orange Community Women hosting a FUNDrive for Clothes and Household Items. The Orange Community Women are asking residents to bring clothing, shoes, towels, electronics, toys and games, kitchen items, sporting goods and more to the pavilion that morning. This benefit will help support many community projects. The secure, on-site paper shredding service will once again be handled by town resident Joe Johnston’s company, Affordable Solutions. 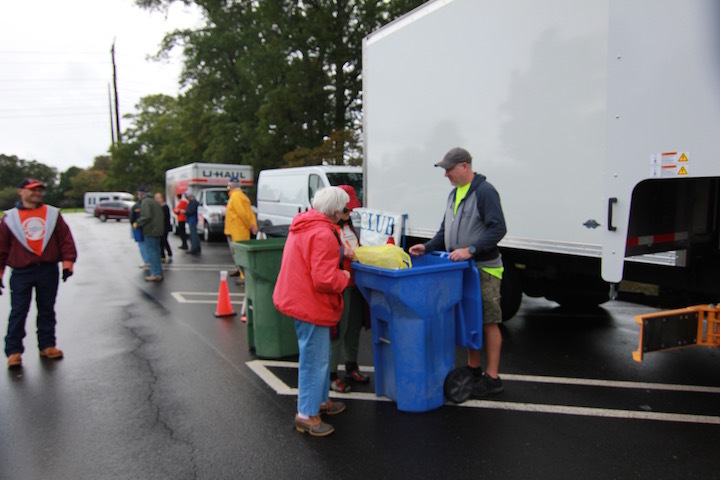 Residents may bring bags or boxes filled with documents for shredding and volunteers from the Orange Recycling Committee will deposit them into the shredding truck. This service is generously funded by the Rotary Club of Orange. 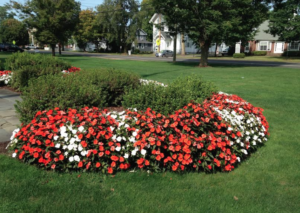 Residents may show their appreciation by donating to the Orange Rotary Scholarship Fund. Rotarians will be on hand to collect donations. Residents also may bring mattresses and box springs for recycling. This free service is made possible through a partnership with the Mattress Recycling Council’s Bye Bye Mattress Program. Dry mattresses (of all sizes) and box springs will be accepted. However, mattresses from futons/sofa beds or waterbeds; mattresses infested with bed bugs; wet, damaged or excessively soiled mattresses; sleeping bag or mattress pads/toppers, are not part of the program. For the seventh time, the Orange Recycling Committee is helping residents dispose of thousands of pounds of sensitive financial and medical papers in a secure, environmentally- responsible way. Adding mattress and box spring as well as household goods recycling to this event has made this one event not to be missed. can go in the regular residential recycling bins.  Mattresses and box springs. kitchen items, sporting goods, knick-knacks. The Orange Community Women do some really awesome things for the community, but this is, by far, one of the best. 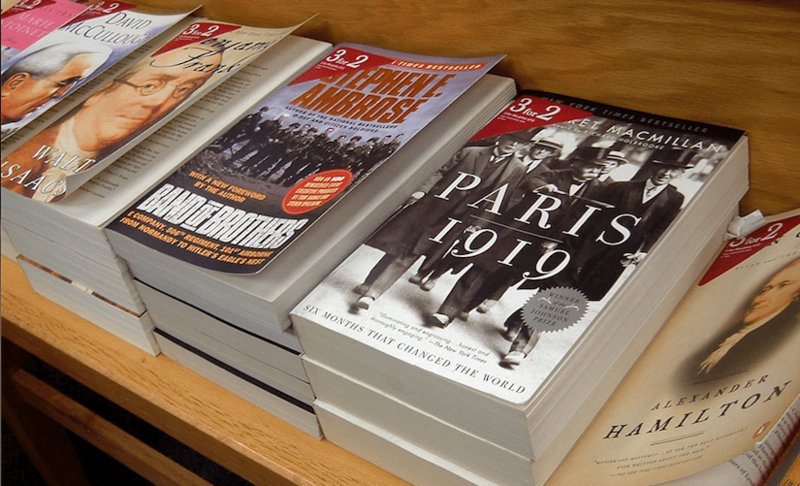 The OCW will be having a Paperback Book Drive for Veterans from Monday, October 29 thru Friday, November 9. A box will be set up in front of the First Selectman’s Office in the Orange Town Hall, 617 Orange Center Road. The donated books will be distributed at the VA Hospital in West Haven. So, gather up your paperback books for this great cause. 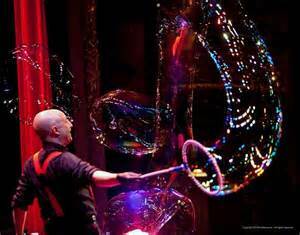 Orange Community Women (OCW) invites you to see “Casey Carle’s BubbleMania” at High Plains Community Center, on Saturday, January 20 at 3 p.m.
BubbleMania is a highly-acclaimed show combining the science of bubbles with theatrical showmanship and comedy. Its website describes the show as an “extremely unique program combining high energy entertainment with artistic achievement. BubbleMania is loaded with visual comedy, quick wit, big band swing music and the untamed, often unbelievable qualities and beauty of spherical liquids: 20-foot bubble serpents; bubbles that bounce, dance and shimmy; jaw-dropping fog filled bubble sculptures; gravity-defying blobs of bubble foam; bubble spaceship; crystal ball; soap bubble ping-pong and more! This will be a wonderful community event and lots of fun for all ages. This show is sponsored by the Jamie A. Hulley Arts Foundation. Tickets are $7 at the door – under 1 free. For more information on Orange Community Women, contact Donna Wesolowski, 203-799-3519. Connecticut’s history is filled with remarkable women who have achieved extraordinary things. Women have been involved in military conflicts from the beginning of time; some as warriors, some as spies and others who made the munitions or simply called for peace. gender norms, and often without the recognition they deserved. We will learn more about this year’s Hall of Fame inductees including our own Captain Kristen M. Griest, Amity graduate, and the first female infantry officer in the US Army and one of the first two women to graduate from Army Ranger School. This free event, part of the Connecticut Women’s Hall of Fame “Talks on the Road” series will be held on Thursday, October 19 at 7:00 p.m. in the Case Memorial Library. Orange Community Women is a chapter of Connecticut Junior Women, Inc. and seeks to unite the women of Orange and surrounding areas by participating in community service and providing enrichment, leadership and social interaction. The Orange Community Women, an organization dedicated to helping worthy causes in Tthe area is running a FUNDrive under the Pavillion at High Plains Community Center, 525 Orange Center Road on Saturday, Oct. 14 from 10 a.m. to 1 p.m. The OCW is asking the Orange community to donate clothing and household items to help them raise money for a variety of programs. They will be accepting clothing, shoes, bedding, towels, accessories, CDs, DVDs, Books, electrical items, toys and games, kitchen items, knick knacks and sporting goods. The Orange Community Women’s projects support Amity Scholarships, the Case Memorial Library, Veterans, the Tracy Bunch, Relay for Life, Silverbrook, Orange Community Services, Days for Girls, Manes and Motions Therapeutic Riding Center and Female Soldiers/Forgotten Heroes. If you can’t make it to the Pavillion on Oct. 14, contact Michelle Bailey at 203-605-4363 or by e-mail at fbailey1@optonline.net for an advance drop off or pick up. The FUNDrive is held in cooperation with the SAVERS store, 130 Boston Post Road, Orange. Fire Chief John Knight and Volunteer Firefighter Lisa Kaplan with members of the Orange Community Women. Orange Community Women (OCW) recently presented the Orange Volunteer Fire Department (OVFD) with a $200 check from the money earned from community activities during the past club year. The Orange Volunteer Fire Department is 92 years old and volunteer run with 60 active members. Chartered to provide fire service for the Town of Orange, they also own and maintain the trucks as well as maintain the fire houses. The OVFD is in the process of purchasing a new truck that will be used for protection of life and property in the town of Orange. The new fire truck will cost about $850K, without all the necessary equipment. The Orange Volunteer Fire Department appreciates all donations as they can apply the money where the need arises. For example, full gear with tanks and masks costs several thousand dollars for each firefighter. When a call comes into the police station, our volunteer firefighters hit the ground running. OCW hosts various activities throughout the year and the proceeds are returned to the Orange community. This Fall, OCW is coordinating a Children’s Fair Fact Scavenger hunt at the Orange Country Fair to help promote all of the fun activities at the fair. In October, they will have a Saver’s Fundraiser to turn community donations back into cash for the community. Also in October, OCW will present a “ Women & War “ lecture from Connecticut Women’s Hall of Fame “Talks on the Road” series at the Case Memorial Library. Check back here soon for further information. OCW meets at the High Plains Community Center, 525 Orange Center Road, at 7 p.m. on the 4th Wednesday of the month and new members are always welcome. For information about joining OCW, please contact Donna Wesolowski at donnaweso@optimum.net. The Orange Community Women (OCW) hosted “Casey Carle’s Bubble Mania” show at High Plains Community Center, on Saturday, January 28. The standing room only crowd seemed to astound the hosts. Bubble Mania is loaded with visual comedy, quick wit, big band swing music and the untamed, often unbelievable qualities and beauty of spherical liquids. This was a wonderful community event and lots of fun for all ages. Children and adults alike laughed out loud and stared in awe as Bubble Master Casey Carle worked his bubble magic. Publicity Chairman Laura Griest said, “Orange Community Women is a chapter of Connecticut Junior Women, Inc. We seek to unite the women of Orange and surrounding areas by participating in community service and providing enrichment, leadership and social interaction. “Thank you for supporting OCW,” members said. For more information on Orange Community Women call 203-799-3519. Due to a camera malfunction all of the photos from this event are terrible! The Orange Community Women’s group will be collecting paperback books to donate to the VA hospital in West Haven. The collection will run from Oct. 28 through Nov. 18 to encompass Veteran’s Day. There are two locations to donate your gently used paperback books: High Plains Community Center, main entrance, in the drop box pictured above and at the Video Lab drop box located at 200 Boston Post Road, Orange. Paperback books of general interest such as fiction, non-fiction, thriller, drama, comedy, mystery will be accepted. The Orange Community Women group was established in 1985 and is a community service based organization, giving back to those in need in our community, state and globally. Holding an annual fundraiser, and the recent mug and hat sale at the Orange Country Fair, all proceeds support projects such as scholarships for graduating Amity seniors, hosting craft nights with the seniors of Silverbrook Estates, providing food baskets for the needy, Relay for Life and most recently the Days for Girls Organization. OCW operates under the Connecticut Junior Women umbrella. For more information, contact Maureen Boian (203-799-9856) or Laura Griest (203-530-7906). Thank you.